[as] > AEC CAD/BIM > WebGL works again on Android 4.3! Yay! In case you heard me complain on Google+ about the fact that I apparently am last in queue for Google’s mysteriously-timed Android updates: I finally got it (on my Nexus 4)! Yay! As you may know, one of the improvements in Android 4.3 is better WebGL support. So one of the first things I did was check out my Sketchfab models. And as you can see in the attached image, this marvel of modern web-technology works smashingly well! I tried models with reflections and environments and all of that seems to be working fine. What I especially like is the fact that I can now pinch to zoom and do the two-finger pan that I couldn’t do before. 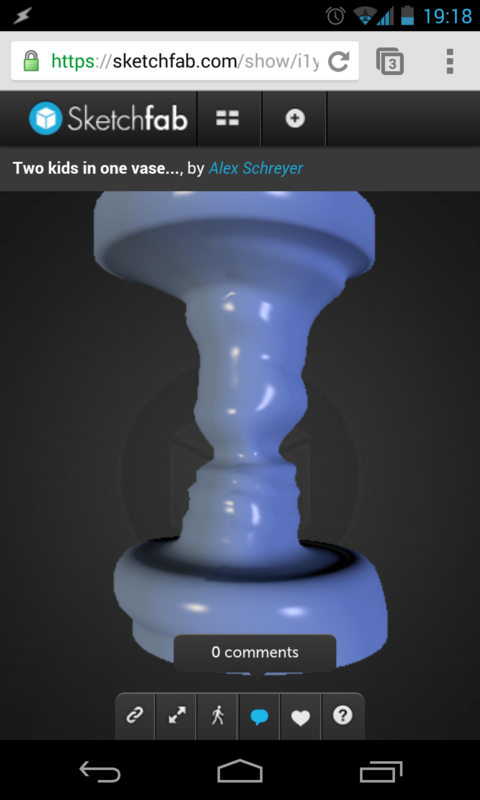 Not sure if that is an Android improvement or whether this was implemented by the Sketchfab folks, though. So if you are reading this on a device that runs Android 4.3, click on the link below to get to a WebGL model of mine and try out the new functionality for yourself. By the way: If you are curious how I made this 3D model, check out my post on sketchupfordesign.com and don’t forget to download my Sketchfab uploader plugin for SketchUp from the Extensions Warehouse to get your own models to the web.